Centre County Mutual Fire Insurance Company (Patrons of Husbandry) has its origins in the Pennsylvania Grange. In 1877, at a time when it was difficult to obtain fire insurance in rural Centre County, our founders chartered an insurance company under the newly formed Pennsylvania Insurance Department. What started as a mutual effort among rural farmers and businesses in Centre County has developed into an insurer of homes, farms and businesses throughout much of Pennsylvania. Our founders were Isaac S. Frain - President, John H Barnhart – Treasurer, and George Taylor, Secretary. Additional founders who signed the charter document were; Lafayette Neff, Jacob Dunkle, John H. Biddle, J.E. Royer, James A McClintic, Uriah Stover and J. N Hall. The founders were all members of the Centre County Pomona Grange. The Grange, an organization promoting farming and farm life, had formed a local chapter in 1873 under the leadership of Centre Hall area farmer Leonard Rhone. A year later the Grange started a basket picnic in Leech Woods west of Centre Hall. This evolved into an annual event we have come to know as the Centre County Grange Fair and Encampment. In 1877, the last Federal Troops were being withdrawn from the South, as the Civil War Reconstruction era ended. It was the start of an industrialized urban society. But things were in transition. Many American cities were of considerable size and there was substantial industry. However, the hallmark of American society continued to be the farm and the small town. American life still revolved primarily around the local community. Civil War General John Hartranft was Governor of Pennsylvania and his approval signature is on the company’s charter. Rutherford B. Hayes was President of the United States. 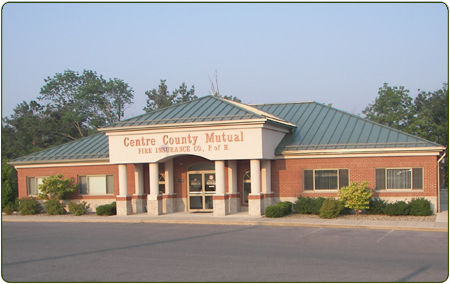 As time passed the company expanded and as Pennsylvania commerce grew so did Centre County Mutual. Also, other policy holders became directors and officers of the company. The company’s office was often housed in the Secretary’s private home with business being conducted at the kitchen table. From these humble beginnings Centre County Mutual has continued to provide protection for the honest, hard working citizens of Pennsylvania.